A new three-year programme to help the Church of England's 42 dioceses work to support victims of modern slavery and identify the signs of exploitation in their local communities has been launched. Called the Clewer Initiative, both the Archbishop of Canterbury and Prime Minister Teresa May have given their backing to the new project. Caroline Clarke, Diocesan Community Engagement Advisor, campaigned for the Diocese to be involved in raising awareness about modern slavery, receive the specialist training and play its part in bringing slavery to an end, and we are pleased to have been accepted as one of the 11 participating dioceses. 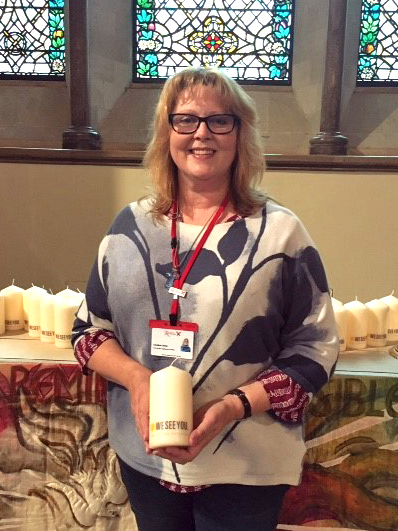 At the launch, Caroline received a candle to bring back to the Diocese as a reminder to pray for the work of the initiative, and for those who are trapped in modern slavery. Work is already under way in the participating dioceses with training and information sessions on how to provide support and identify victims of labour exploitation in areas from the construction and property sector to hand car washes in British cities and shipping. Rochester Diocese is supporting this by holding its own Modern Slavery Conference on 16th June 2018,. There will also be training, workshops and talks throughout the year from several organisations including the Gangmasters Labour Abuse Authority and the agencies already supporting victims. Caroline says: "Loving our neighbour also involves increasing our awareness and understanding of the issues affecting our communities so that we can be fully involved in bringing transformation, whether through our hands on care and prayer, supporting the agencies who are already involved, or campaigning for justice. Modern Slavery has been a hidden issue for far too long. - How to raise awareness of modern slavery in their community. As part of a video highlighting one women’s story of slavery, The Archbishop of Canterbury, Justin Welby, encouraged churches to act as 'eyes and ears' in local communities to identify victims. More information on the Clewer Initiative can be found here, as well as resources, and a ‘how to spot the signs’ guide. Please also contact Caroline Clarke on 01634 560000 or by email: caroline.clarke@rochester.anglican.org if you have any questions about the programme.